Pakistan, after drawing the Dubai Test, came into the second Test under a lot of pressure, which only increased in the wake of a stunning collapse against Nathan Lyon. Pakistan, after drawing the Dubai Test, came into the second Test under a lot of pressure, which only increased in the wake of a stunning collapse against Nathan Lyon. However, the unpredictable Pakistanis fought back brilliantly to clinch the Test and the series 1-0. "There are a lot of lessons. First of all never give up. There are fewer teams which can stage such a massive win in four days after losing five wickets in the first session. As a captain, I have learnt that I have to keep fighting and keep telling the remaining players to not to throw their wickets away,” skipper Sarfraz Ahmed said after the match. He added that the way they staged the comeback, they looked more mentally strong than Australia. “Credit goes to Fakhar Zaman on how he played with me. And, then in the second innings again. Azhar Ali, Fakhar Zaman, Asad Shafiq, Babar Azam all of the batters. 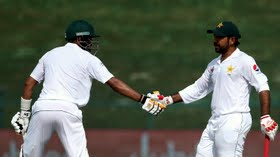 Pakistan have been a better team in the series,” Sarfraz added, expressing his thought. The captain did admit however that this isn't the best team, and that lot of improvements needed to be made. “We need to bat maturely if we have to play Test cricket. We give away too many soft wickets after scoring runs. We need to talk to our batsmen about it. Younis Khan used to tell us that if we get going in Test cricket, we should look to prolong our innings. But, we are struggling on that front," he admitted.